While light-hearted easter eggs certainly don’t help Tesla sell more cars, they certainly don’t hurt from a branding perspective. Over the past few years, Tesla easter eggs have only gotten better, more ambitious, and far more creative. In recent memory, Tesla has introduced any number of whimsical software surprises for Tesla owners, including a ‘Santa Mode’ and a funky holiday-themed easter egg that transformed the Model X into a music-playing dance machine. The latest easter egg from Tesla involves a number of reference to Back to the Future, the 80s movie classic starring Michael J. Fox. While some of Tesla’s easter eggs are easy to find, this one was hidden a little bit better than most. The 80s-themed surprise was initially posted to Reddit after a Model X owner stumbled upon it a few days ago. 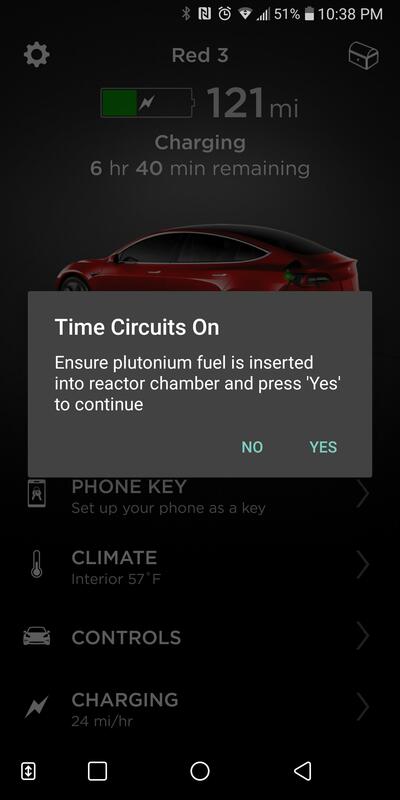 The newly discovered easter egg can be accessed if you have the Tesla app (it works on both Android and iOS). If you happen to be charging your car when there’s 121 miles left of range, the entire app screen starts displaying a slew of Back to the Future references. For example, users will note that their car is due for service in 1955, an obvious homage to the year Marty McFly went back in time to in the movie. In the photos below, you’ll also notice the Back to the Future reference to 1.21 gigawats and, of course, plutonium.